Sure you have gotten the right facts about acne and acne treatment? Acne, also known as pimples or zits, is one of the most frustrating, depressing, and yet most common skin problems today. But do you how it happens? What causes it? Poor hygiene, dirt, medication, chocolate, greasy, spicy food that causes "heatiness" in the body, or simply wrong diet? Dispel these myths and get some truths about acne and acne treatment. At the onset of puberty, the hormone testosterone produced in both males and females causes the oil glands in the skin to grow and produce more oil or sebum. At the same time, the skin inside the pores also grows and sheds off more quickly. 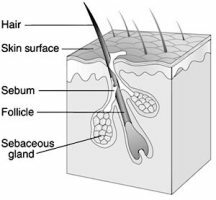 The sebum mixed with dead skin cells, and sometime bacteria, forms a sticky plug that blocks the hair follicles or pores. Clogging of the oil on the skin hence causes acne to form. Acne appears commonly on the face and upper chest and back, but it can also happen all over our body, except where the skin is without hair, for example, palms, soles, lips. The most prominent place where acne manifests is in the medial facial zone, where four to ten times more oil glands are found than in any other part of the body. Initially acne arises only as white heads or black heads. The mixture of hardened oil and skin debris can become food for acne bacteria. With bacterial infection, red spots, white pus bumps or cystic lumps appear. If not treated in time properly, these can develop into severe acne, which is red, ugly and painful. Many adults in their 30's, 40's and even beyond are also known to have acne outbreaks. Factors causing acne eruptions include biological hormonal changes, intense emotion, stress and sleep depravity. Wash your face twice a day, in the morning and at bedtime with warm water and a mild soap or cleanser. Too frequent washing can actually irritate your skin and cause your acne to become worse. For acne treatement, use soaps and cleansers that are "non-comedogenic" (does not irritate acne) and apply water-based, oil-free makeup. Oil-based makeup may cause acne to get worse. Avoid harsh alcohol-based cleansers and cleansers that contain oil and never scrub your skin harshly. Gently pat your face dry with a clean towel. Use an oil-free sunscreen if you are outdoors. Do not squeeze or break your pimples. This will most definitely cause more inflammation and tissue damage and scarring. Do not rub or touch the skin on your face. Do not wear headbands, chin straps, or tight hats that rub against your skin and causes irritation. Keep hair off your forehead and away from your face. Wash your hair every day to keep it away from excessive oil. If you wear glasses or sunglasses, clean them often, especially the bit that sits on your nose, which tends to be one of the oiliest areas in the face. Change your sheets and pillowcases as often as you can. While acne is not caused by poor hygiene, a good routine can help control it. The traditional honey remedy is excellent for treating oily acne prone skin. It possesses natural humectants that help keep the moisture in your skin. Honey feeds the skin with its natural nutrients and plays a role in killing the bacteria that causes acne. After having thoroughly cleansed your skin, you can then apply pure raw honey to the affected area. Keep it about 20 to 30 minutes and then rinse off. Some people also advise mixing two tablespoons of Manuka honey to get rid of your existing pimples before they can cause acne scars. Apply the honey cinnamon paste as a facial mask and leave it on for 1 hour before washing it off with warm water. Repeat this acne treatment for two week. Other than cinnamon powder, bee pollen (ground to powder form) has also been identified and reported as an effective ingredient in honey facial masks for treating acne. In cases of severe acne, always consider seeing a dermatologist. End of 'Get Right Acne Treatment and Control". Go to "Seeking Natural Cure".